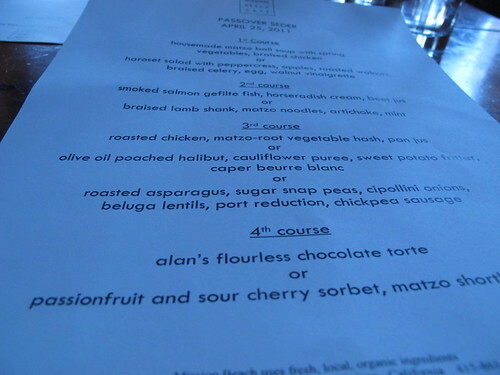 Passover ended yesterday at sundown; we marked it by indulging in another seder, this one at Mission Beach Cafe. First let me say that it's rare to see a restaurant (not counting Jewish-style delis) have a special meal for Passover, most focus solely on Easter. When I got an email last week about the dinner, I just knew we had to go and immediately booked a table. The four course meal was reasonably priced at $55 per person not including tax, gratuity or alcohol. We opted for 2 half carafes - a Cabernet Blend to start and a Viognier for the entrees. We paired our dessert with a Barbera Port. Our total bill was roughly $100 a person. NOTE: Typically when we dine out I have the chef eliminate dairy from my courses. As with our French Laundry dinner in February, I wanted to experience the food as the chef envisioned so ignored for the night that I suffered from allergies. Our dinner started with amuse bouche - somewhat misnamed in this case as it required multiple bites. That criticism aside, it wowed and gave us a perfect preview of what was to come. The chef topped a sunchoke puree with oyster mushrooms, roasted garlic, turnip, dill, and matzo and a side of Cornichons (aka Gherkins). 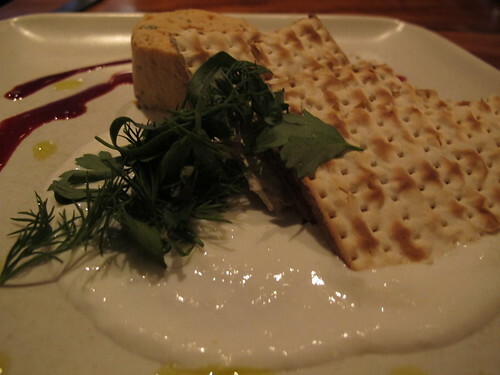 I especially enjoyed the contrast of textures - the puree, the crunch of the Gherkin, and the snap of the Matzo. I blended the components to savor in one bite the sweetness of the Gherkin, the saltiness of the Matzo, the rich creaminess of the puree, and the tang of the dill. After this prelude, we couldn't wait for dinner to begin. 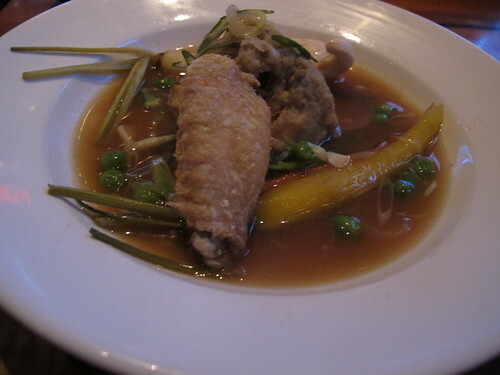 The first course took on old favorites - Matzo Ball soup (pictured at the top of the post) and Haroset. With our second course, I discovered there was a logical flow for the dishes. The Matzo Ball Soup was best followed by the Braised Lamb Shank, the deconstructed Haroset by the smoked Salmon Gelfite. 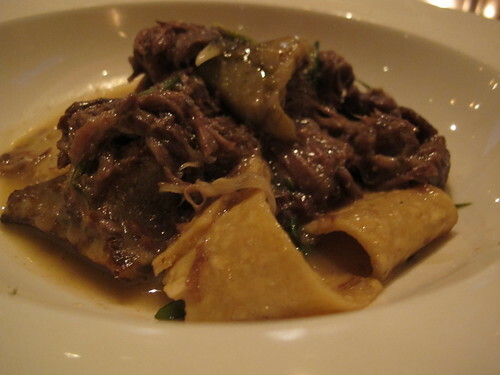 The Braised Lamb Shank with Matzo Noodles brought back memories of our first dinner at Farina. (We had a Wild Boar Ragout with Housemade Noodles.) Mission Beach Cafe nailed the mouth feel. 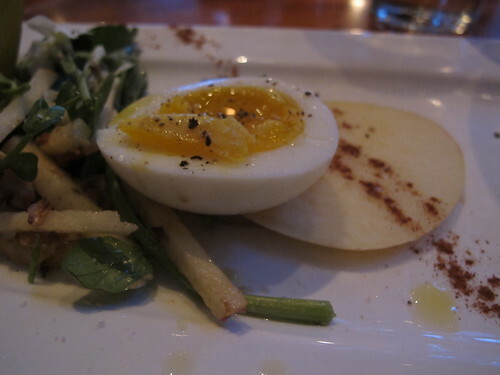 Unfortunately the chewiness and consistency of the Matzo Noodle left me a little underwhelmed. I can only imagine how hard it is to make fresh pasta, I've only attempted fresh gnocci, but I wasn't sure if the noodles were just a little shy of al dente or just an odd consistency given that Matzo was used in place of All-Purpose Flour or Rice Flour. If you're wedded to traditional Gelfite fish the smoked Salmon won't be up your alley. I love Salmon. 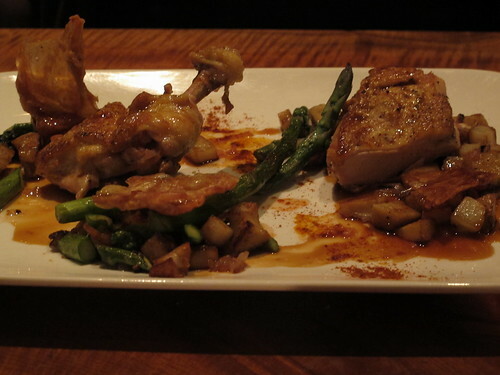 I love food that excites the taste buds and leaves you wanting more and wondering if it ever existed at all. 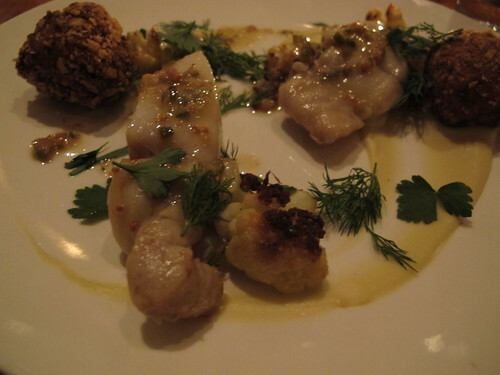 In texture, this Gelfite fish was closer to a Salmon Mousse. The pairing with Parsley (the bitter herbs on your Seder plate) and Horseradish (Maror) with the matzo and Salmon was wonderful. I loved spreading the salmon on a cracker, topping with a little horseradish and some herbs, and sandwiching between another cracker. cubes agreed that the Horseradish Cream was inspired. Hands down our favorite course was the Matzo Ball soup - the richness of the broth, the fully developed flavors; the bar for best Matzo Ball soup has been set and it has been set high, very high. 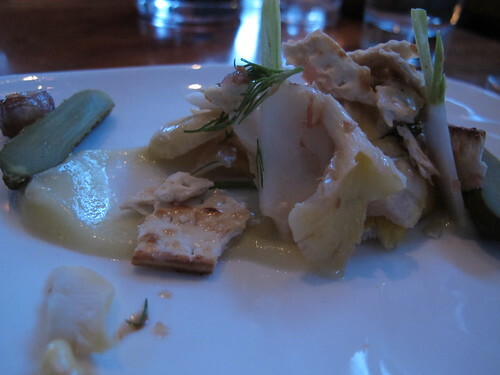 In second place, two courses tied - the Roasted Chicken and the Olive Oil Poached Halibut. I was torn between choosing the Braised Lamb Shank or the Olive Oil Poached Halibut but the Matzo Noodles were the deciding factor. Once again I was unable to finish all of my food - the portions were definitely hearty and took home 1/4 of the Roasted Chicken and 1/4 of the Olive Oil Poached Halibut for today's lunch. Full size photos of all the courses are on Flickr.